Double Punishment is the unjust policy used against non-citizens who face deportation after already being punished by the criminal justice system. Non-citizens include people who have had permanent residency since childhood, who may have little to no connection to their country of origin, and who have already established lives and families in Canada. 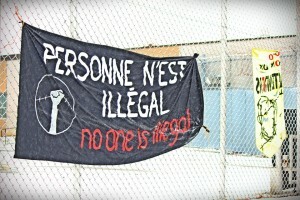 Like citizens (as defined by the Canadian settler state), they must go through the criminal justice system and complete their sentence, while facing the added consequence of being permanently removed from Canada, regardless of what it might mean for their families, their safety, their ability to integrate into their country of origin, and the emotional hardship of being expelled from the country. Simply put, non-citizens who commit a crime can be subjected to a “double punishment” through the collaboration of punitive criminal and immigration laws. The policies surrounding Double Punishment are racist and create a two-tier justice system in which immigrants face far more disastrous consequences for committing crimes than Canadian citizens. What Does It Look Like Under Law? Under the current Immigration and Refugee Protection Act (IRPA), non-citizens can lose their permanent residency and be deported based on the perceived “seriousness” of a convicted crime. In section 36.1 of the IRPA, both permanent residents and foreign nationals are deemed inadmissible on grounds of serious criminality punishable by a maximum of ten years of imprisonment, despite potentially serving a shorter sentence or receiving no prison time at all. A crime is also considered “serious” if the sentence imposed is over six months. Subsequently, section 36.2 of the IRPA states that a foreign national is deemed inadmissible if convicted of an indictable offence, or two summary offences1. Finally, section 36.3 specifies that a “hybrid” offence2 is deemed indictable for immigration purposes even if it is prosecuted summarily. As defined by the Immigration and Refugee Protection Act, “serious criminality” does not distinguish between maximum sentence and sentence actually served, ignoring the judge’s interpretation of severity. The law also encompasses a wide range of offences punishable by a maximum of ten years or more (e.g. assault, credit card theft, producing false documents etc). Even further, minor offences can be considered a “serious crime” for immigration purposes by dismissing the nuance of hybrid offences. Consequently, individuals found to be inadmissible on grounds of serious criminality can make no appeal to the Immigration Appeal Division if they are sentenced to more than two years and cannot have their deportation order set aside based on humanitarian or compassionate grounds. In sum, a deportation order is made without considering the nuance of their sentence, the possibility of rehabilitation, how long someone has lived in Canada, and the degree of hardship faced by their removal. What is even more ominous is that currently, the Conservative government of Canada is trying to push a new piece of legislation entitled “Bill C-43, the Faster Removal of Foreign Criminals Act.” If passed in its current incarnation, an appellant’s ability to have their cases reviewed by the Immigration Appeal Division will be restricted to only those who receive a sentence of less than six months. In effect, permanent residents can lose their status for even the most minor offences such as shoplifting, causing a public disturbance, or dangerous driving, as examples. Other aspects of the bill include making no distinctions between conditional sentences served in the community for less serious offences (which tend to last longer) and jail sentences, as well as overly harsh consequences for people who have misrepresented themselves (which can include mixing up dates or omitting employment history). This bill is yet another attempt to easily expel immigrants from Canada and heighten a climate of xenophobia and racial exclusion in Canada. It will also increase fear and precarity in migrant communities, who are already targeted by racial profiling and current racist immigration laws and barriers. Double Punishment represents a targeted assault on migrant communities, specifically communities of colour, who are overrepresented in both the criminal justice system and in double punishment cases. Framed as “security threats” and a “danger to the public,” the demographics of those facing double punishment reveal the racially discriminatory nature of these terms and policies. For example, a study of the Immigration and Refugee Board Appeals Division illustrated that the top representing countries based on appeal cases are Jamaica, Iran, India, Vietnam, Guyana, and Trinidad. Of the 151 appellants in this study, 35 (23%) came from Anglo or Western European nations. The remaining 116 (77%) came from countries that are primarily non-white. The occurrence of double punishment cases in non-white communities is directly linked to racial profiling. A recent study of Montreal police reports has proven that racial profiling is rampant in this city. Neighbourhoods such as Montréal-Nord, St-Michel, Parc-Extension, and Côte-des-Neiges are over policed and criminalized due to the density of migrant and racialized communities in that area. This is revealed through the implementation of special police squads that were created to fight street gangs such as “Avance” (2005-2008) and Éclipse (since June 2008). Related to this, ID checks have increased significantly in Montreal (60% in Montreal, 125% in Montreal Nord, and 91% in St-Michel). These increases were mainly attributed to stopping people who were Black, representing 40% of those who are stopped. While street gang activities represent 1.6% of all criminal acts reported in 2009, it is often used as a platform to legitimize the targeted harassment and criminalization of migrant and communities of colour. In sum, people of colour, specifically youth of colour and Black people are targeted and stopped by the police. Because of this, they will more likely end up in the criminal justice system, despite the crime rates being pretty stable amongst people of all ethnic and racial backgrounds. Furthermore, as racial discrimination permeates through the entire criminal justice system, people of colour often receive harsher punishments, and disproportionately end up with criminal records and in prison. As a result, they will face deportation if they do not have citizenship. Double Punishment is a very clear indication of how racism is embedded in both the criminal justice system and the immigration system, and reveals how people are treated as disposable, undesirable, and less than white Canadians. Firstly, it targets people of colour and approaches them under the framework that they are inherently criminal (especially if we examine how “criminals” are defined not by what they’ve done, but how they are excluded from participating in society, how they are painted as “bad,” and how they need to be expelled). Furthermore, it reinforces the sentiment that immigrants are only worthy of belonging here if they are “good” immigrants, that they are contributing to the economy, that they are internalizing white, middle-class, and hetero-patriarchal Canadian values, and that they do not question and resist the ways in which migrant communities are often exploited and excluded from the Canadian state. Because migrant communities are criminalized and often live in precarity, people who face double punishment often feel ashamed, isolated, and alienated due to the stigma around having criminal charges. This also creates fear around community mobilizing and support. Because there are a lot of people facing double punishment who live in isolation, we need to start talking about double punishment and breaking the silence around this issue. 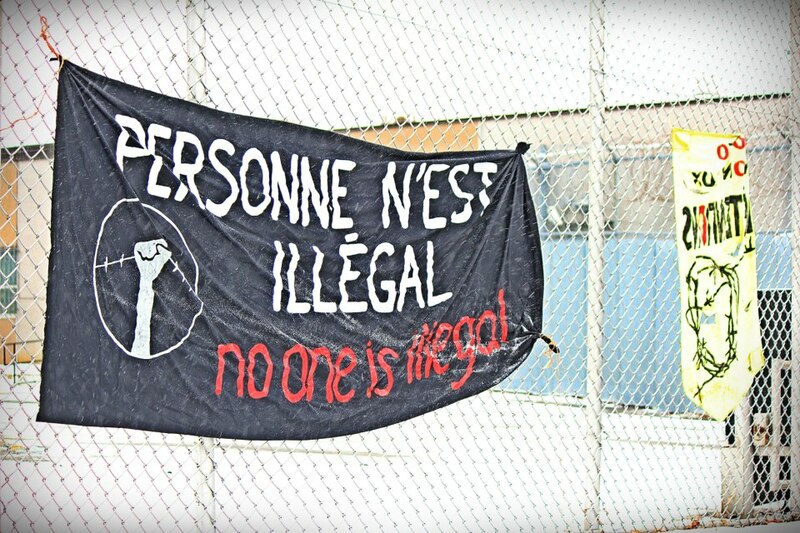 No One Is Illegal Montreal looks at these issues through a lens that states there should be no borders and no deportations as they are enforced by a racist and colonial state whose decisions on citizenship are based on white supremacy, colonialism, and capitalism. We also strongly believe in the free migration of people, as well as the abolition of the prison industrial complex, and support for all prisoners. However, we would like to highlight how the criminal justice system and the immigration system especially targets and punishes racialized non-citizens, again, due to silence surrounding double punishment. We also acknowledge the complexity of this issue and that there are things that people do that we do not agree with, or would consider bad. Yet, we do not believe that simply because they are non-citizens, that they should be deported and subjected to a two-tier criminal justice system. Resistance to double punishment reflects an immediate need in our communities: to break isolation and build solidarity, demystify the belief that there are “good” and “bad” immigrants, and to delegitimize the state sanctioned racism that builds both our prisons and our borders. We aim to break this isolation by taking a clear stance against double punishment, by changing the discourse around it, by building a strong network to expose these injustices, and to support the individuals fighting to remain with their families, friends, and community here in Montreal. – Victor Morales was slated for deportation to Chile after living in Canada for thirty years. – Dany Villanueva faced removal to Honduras, despite living in Canada since the age of 12; the possible removal proceedings against Dany were launched after the police killing of his younger brother Fredy, to which Dany was a key witness. – Farshad Mohammadi, a political refugee from Iran, was killed by Montreal police this past January; Farshad was facing the possibility of deportation to Iran, due to a criminal conviction related to his homelessness, when he was killed. – Jacob Niyongabo, was deported to Burundi in December, a country he fled 16 years ago. – Jean-Bernard Devilmé has lived in Canada for 25 years, with children and a spouse, but was facing removal to Haiti in December due to double punishment.